Studio headphones are a widely available device used by producers, DJs, musicians, and even everyday music lovers. Professional-grade headphones come in a variety of forms, each option providing a unique array of features and characteristics. Due to this range in capabilities, it can be difficult to know which studio headphone is right for you. Audio-Technica is a highly popular and longstanding manufacturer of audio equipment, trusted by customers across the globe for their innovative, high-quality products. 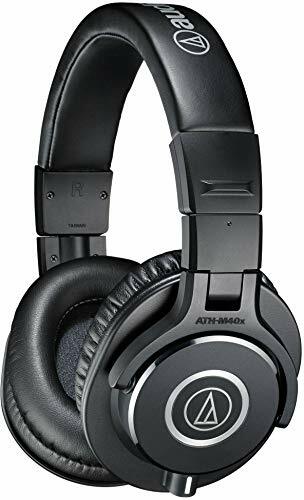 The ATH-M40x Professional Studio Monitor Headphones are an excellent product from this brand, and are a great option to look at for audio professionals and casual music listeners alike. As you shop for the best mixing or recording headphones for you, keep a few criteria in mind to ensure that your selection is up to a high standard. One factor to consider is durability. Studio headphones can easily cost over a hundred dollars, so it’s important that the product will stay in good shape throughout hours of use. A device from a credible brand will likely be more reliable; customer reviews are a good indicator of durability. Many products feature parts that can be replaced, which keeps you from having to purchase a completely new set of headphones when one part wears out. Also, some headphones are designed to be foldable. This feature decreases the risk of damage during travel and storage. The type of earcup in a pair of headphones is another important element to consider. Closed-back, open-back, and semi-open are the three main types of studio headphone. Closed-back headphones are designed with enclosed earcups, which block out all background noise and keep other people from hearing what you are listening to. This type is great for recording tracks and simply listening to music, but can cause ear fatigue after long periods of use. Open-back headphones are open, allowing all sound to leak out and be heard by those around you. Also, the sound from the headphones mixes with any ambient noise around you. These headphones provide a large quality of sound that is desired by most all music producers, making this variety great for mixing. Semi-open headphones are a combination of open and closed headphones; only some of the sound leaks out. This allows for more privacy than with fully open options, but a better sound quality than with closed options. The type of headphones that you choose depends on your priorities and preferences. The level of comfort in a pair of headphones is critical; a combination of ample padding and a good fit will keep the device from causing irritation or pain. High-quality padding should be included in both the headband and the earpads. Some headphone models feature an adjustable frame which can accommodate different head shapes for a better fit. Especially for people planning to wear headphones for long durations of time, it is wise to make comfort a high priority. The ATH-M40x Professional Studio Monitor Headphones are the number one bestselling product in the Recording Headphone Audio Monitors category on Amazon. Over 1,000 customer reviews average a rating of 4.5 stars, making these headphones not only popular, but also highly recommended by a range of consumers. The ATH-M40x headphones feature 40 mm drivers with rare earth magnets, as well as aluminum wire voice coils that are clad in copper. The earcups are circumaural, fitting around the user’s ears to block out background noise, and swivel 90 degrees. An extended frequency and flat tuning makes for an excellent quality of sound. This headphone model from Audio-Technica includes top-notch earpads and headband padding to make the listening experience more comfortable. For additional convenience, the cable for these headphones is removable, and the entire structure is foldable. Especially after reading some of the thousands of glowing customer reviews of the ATH-M40x Professional Studio Monitor Headphones, it is clear that this product is not only of an exceptionally high quality, but also a great value for the price. This model includes almost all of the features of the most advanced Audio-Technica studio headphones, but costs under $100; an outstanding price for a device of its caliber. As a brand, Audio-Technica has been established as reliable, so you can trust this product to live up to that reputation. Expert-level padding in both the earpad and headband not only make the structure more comfortable to wear, but also longer-lasting. Additionally, the apparatus is foldable, keeping the device from breaking during travel or storage. Despite the affordability of the ATH-M40xs, audio professionals will find that the sound quality is up to an expert standard. The circumaural design eliminates ambient sound for a clear, private listening experience, while the extended frequency range and flat tuning make for fantastic accuracy of sound. For one-ear studio monitoring, the earcups swivel 90 degrees. Negative aspects of the ATH-M40xs are few and far between. One con, however, is that the closed-ear design will cause ear fatigue after extended periods of use, which can lead to hearing damage down the line. Also, more expensive A-T headphone models feature earcups which swivel 180 degrees; the 90 degree swiveling capacity of the ATH-M40xs may seem restricted in comparison. The downsides of the ATH-M40x Professional Studio Monitor Headphones are largely overshadowed by the many outstanding qualities that this product has to offer. When it comes to the best headphones for mixing or recording, many factors are a matter of personal preference. The ATH-M40x Professional Studio Monitor Headphones are well-rounded, affordable, and very highly-rated; a superior option for a range of tastes and opinions. Whether you are a long-time musical expert or an everyday music lover, this device could be a great addition to your life.